Posted On 10/13/17 by Paula W from Madison heights , MI Yes, Paula W recommends this product! Posted On 12/03/16 by Paws Up from , FL Yes, Paws Up recommends this product! This travel bowl is perfect for carrying treats and goodies on a walk as well as a water bowl. I have two and use one to carry poo bags. Awesome and durable product by Doggles. Posted On 05/18/16 by Crystal T from Ocoee, FL Yes, Crystal T recommends this product! I love this travel bowl. It is cute and holds up well for short amounts of time. I don't recommend using it for longer than an hour, the water starts soaking through. Posted On 05/02/16 by Emily G from Raleigh, NC Yes, Emily G recommends this product! I purchased the large bowl after falling in love with the smaller bowl! These are amazing for travel and awesome that they can also hold water! Posted On 04/13/16 by Derick D from , MD Yes, Derick D recommends this product! This is perfect for a quick rehydrate when out on the paths. Love the fact it folds up and has a snap for a small profile. Well thought out. Posted On 02/29/16 by Emily G from Raleigh, NC Yes, Emily G recommends this product! 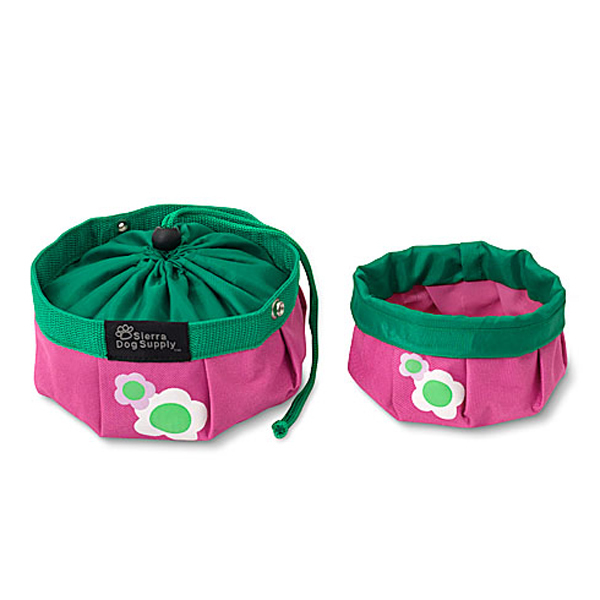 I was looking for a travel food bowl to take when my dog goes to doggy daycare - this small size is perfect since she just eats one meal while there. I loved it so much that I just ordered the large one too!!! Posted On 06/05/15 by Lynn S from Maplewood, MN Yes, Lynn S recommends this product! Posted On 11/11/13 by Adam Blazak from Hammond, IN Yes, Adam Blazak recommends this product! Used it for the first time yesterday, and the water stayed perfectly in the bowl. It is similar to those blue, above-ground pools that are circular in shape. Keeps the water in without any foundation or side structure. We purchased these and find that they are just as cute as the picture shows. They hold water well and the pugs drink out of them fine. We find that, when on the road, we are more inclined to use a regular bowl instead of these--it's easier and we don't need to leave it out to dry out. However, if we are carrying a backpack and need to tote along a little bowl, this is ideal. Use it? Not much. But when we do use it, we love it! Found this site by accident and enjoyed looking at their products.